Just got the “mainframe” running! So, I just got my latest acquisition, an IBM PC Server 500 System/390, running. Here’s what I used – some things linked, some things not. P/390 microcode – I wouldn’t normally link this, but it’s utterly useless if you don’t have a P/390, and if you have a P/390, you’re entitled to it. It’s in the DISK7 folder. Fixpacks are available on the same page as well, but I’ll download those later. First thing I did, once I got all the cards reseated, replaced the CMOS battery, and reseated some drives, was firing up the Reference Disk. Once that was done, I started configuring the RAIDs, and trying to get drives going. I couldn’t get the biggest drives going, but that’s OK.
Once I got the drives going, and fought with the CD-ROM for a while and got it going, I installed OS/2. That required that I write the OS/2 floppy images (did it from within a VM on OS/2,) and then add the DAC960.ADD and DAC960.SNP from OS/2 to them, so the SCSI controller would be recognized. 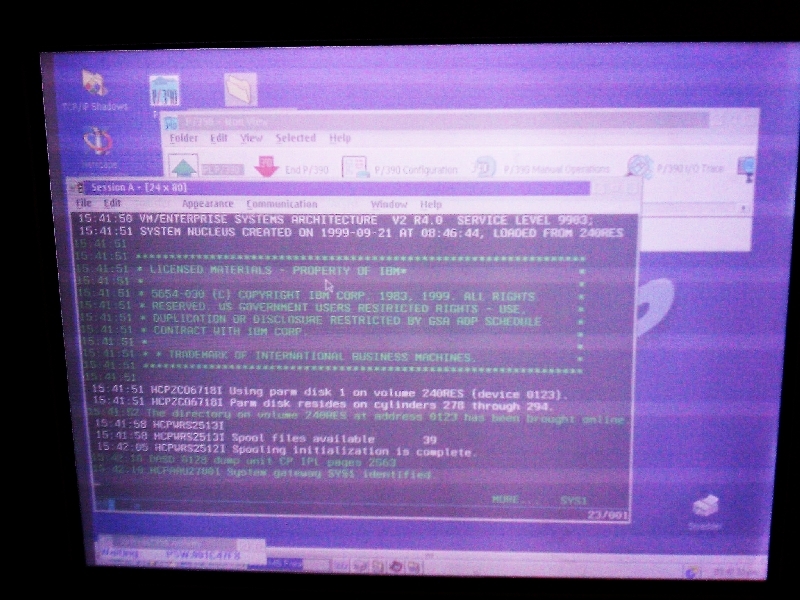 Once OS/2 was installed, I wrote out the P/390 disk images, and installed that software. (Hint: while there may be disk1 through disk6 folders in that microcode zip, don’t use them.) I decided to grab the LIC disk, and merge it with the contents of the disk7 folder, and renamed the volume to P390 DIAG, which was needed to install the Licensed Internal Code, or the microcode. With that success, it was time to install Personal Communications/3270 TCP/IP Entry Level, IBM’s free TN3270 client, which would be used as the console for the mainframe. Unzipped all of those files into a folder, and ran the installer, and now I had one more piece of the puzzle. Finally, to install VM/ESA. I ended up having to copy some files over the network (for some reason, it wasn’t reading the CD,) but it otherwise installed fine. Not much left to do… just fire up PC/3270, connect to localhost port 7490, and IPL P390. 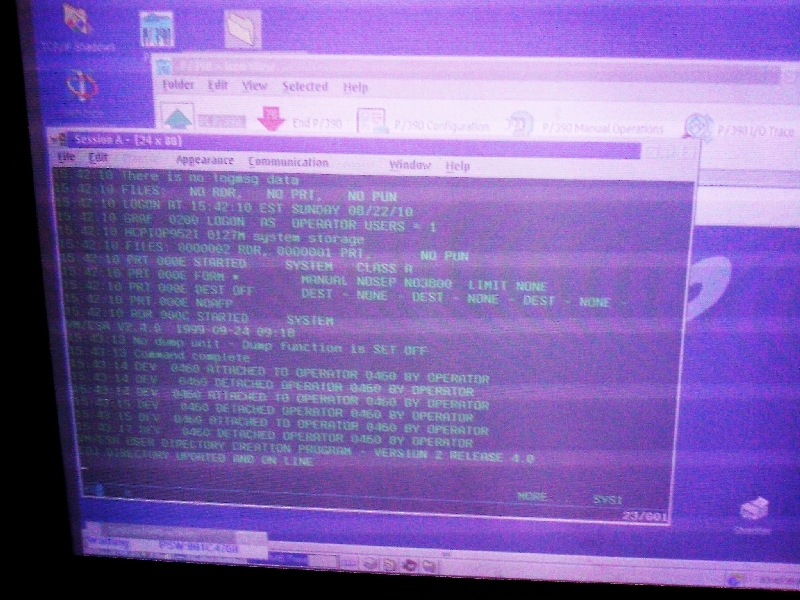 And that’s how you get a circa-1995 micro-mainframe running. Problems are that the third bay of drives aren’t set up properly yet, the graphics output gets very dim as it’s running (you can see in the IPL images that I’ve had to enhance the contrast a lot,) and I don’t have a driver for the Olicom 10/100 Ethernet card. Other than that, it seems to be pretty good to go. 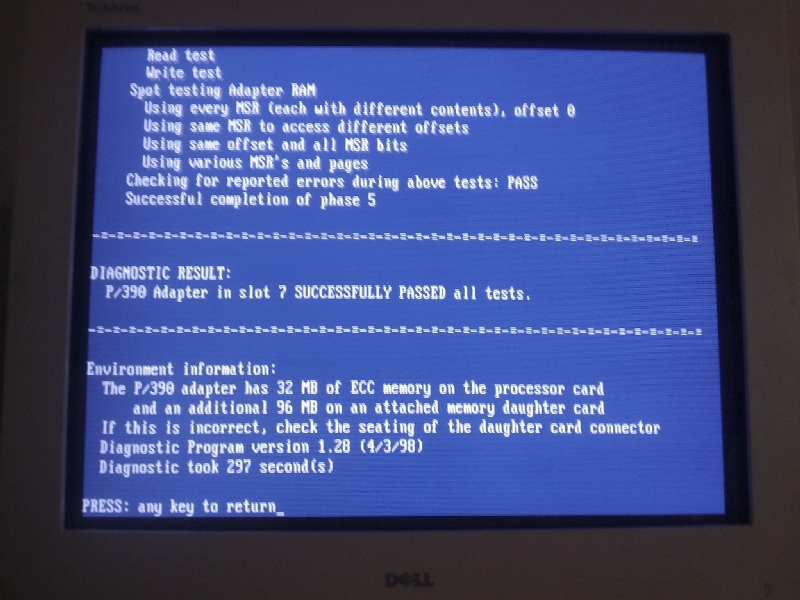 Are you still running your PC Server 500 ? I have one with VM/SP loaded on it, but I am having boot problems with the main processor card. Apparently this is common. Is there any online group to join of Server 500 owner/users? My system is from my now defunct mainframe software company up in Canada. An RS 6000 P/390 MVSsystem is sitting beside my Server 500! Unfortunately, I’m not – the machine appeared to have a damaged chassis, and I think it was shorting out Pentium processor complexes and causing them to fail. I ended up saving the cards, though, and put them in an RS/6000 Model 250. Haven’t booted that machine in quite a while, but I still have it. I did a replacement for my P500 after some years, I found some damaged parts. 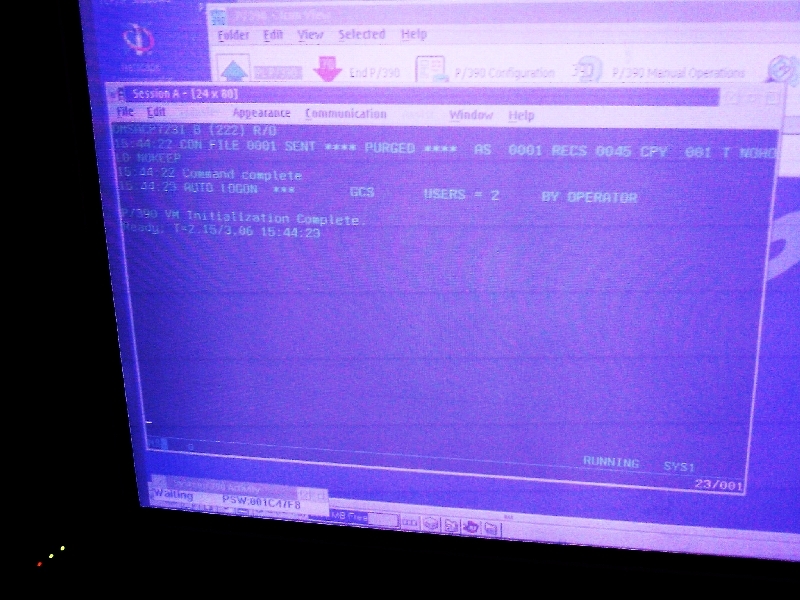 It was running fine but after my array crashes I needed to reinstall my VMSP rel5. For my bad luck only OS base and some product could be restored due to a problem in CD media. I just need an old COBOL OS/VS II (PN 5668-958). Do you have this compiler? Could you share it? If any of you guys ever decide to part with the IBM PC Server 500 , I am looking for a 500 / 520 chassis in good condition. Next Post: What do you like about your favorite OS, and what do you dislike about it?